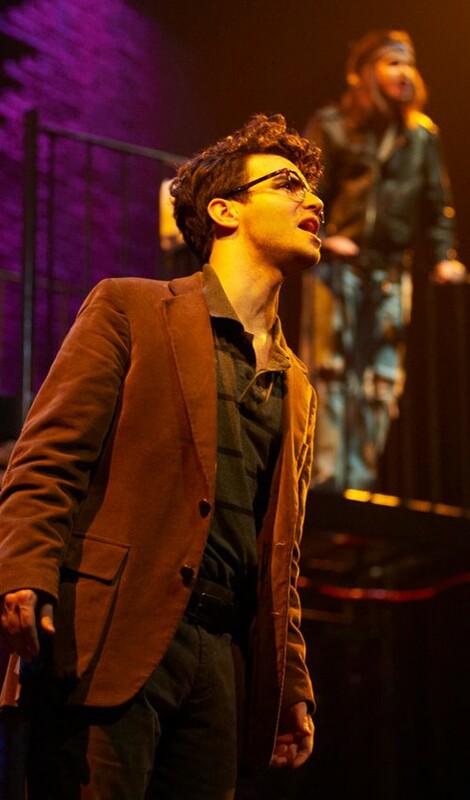 The highlight of Theatre Sheridan’s Rent, Joel Gomez lent the iconic role of Mark new details and a uniquely beautiful voice, scoring him a Best Student Actor nod in this year’s My Theatre Awards. The sweet and candid singer/songwriter took the time to answer our questions about making Mark his own and leaving Sheridan for the real world. As far as I can remember, it was Beauty and the Beast in Toronto, and I was beside myself with joy. Before that, it was four-year-old me, directing my classmates in my own Junior Kindergarten reproduction of the Beauty and the Beast movie for my teacher. In other words, it was a lot of Beauty and the Beast. What actors and actresses have always inspired you? Are they the same today? I don’t know if it was so much actors or actresses as it was singers. I grew up on Whitney Houston, the Bodyguard movie and soundtrack, and I went through this phase where I just wanted to be in movies after that. As I got older, it became Dean Martin, Frank Sinatra, Freddie Mercury, N*Sync, Beyoncé going solo, and, shamelessly, American Idol. I grew up in a large, unusually musical family with tons of singing, so I honestly couldn’t tell you when I started. The only thing was: I wouldn’t sing in front of anyone other than my mom. I absolutely refused, and would panic and hide if someone asked. It wasn’t until I was twelve or thirteen – with talent shows and my elementary school’s Christmas musical – that I started coming out of my shell. There was always something liberating about it being an “official” performance. I wasn’t Joel anymore and I didn’t have to hide. I had permission to be someone else on stage, and that was freedom. How has Sheridan shaped who you are as a performer? Sheridan gave me a skin thicker than I thought I’d ever have. Eventually, you just have to start caring for yourself, taking criticism for what it is, and learning to trust your own instincts. I know there’s plenty more criticism to come, but I think I’m a tad more comfortable with it thanks to the program. Do you have any dream roles you think are perfectly suited to you or something completely against type you’d love to try as a challenge one day? Honestly, my dream role would be to be a working musician, songwriter, and producer. I love theatre, and I learned a lot from going to school for singing, acting, and dance, but my heart will always remain with music. It’s what pushed me into performance in the first place, and the reason I am where I am today. As a challenge? I’ve got a few unfinished musicals. I’d love to finish one and see it on its feet one day. That’d be incredible. Which directors and actors have had a major influence on you throughout your career? Do you have any favourite people to work with? I always feel some kind of kinship with my music directors. There’s always something positive they teach me, and I feel a sort of support from them, even when I’m feeling like a goof, stumbling through the role I’m rehearsing. They’re always there to say, “Great work, now fix all your cut-offs and we’re good.” And in that, I feel absolute solace. Jeffrey Huard springs to mind when I think of who has made an impression on me. I had the pleasure of working with him twice at Sheridan, where he music directed Most Happy Fella and Sweeney Todd. He just demands excellence from everyone. And the beauty is; he gets it. He taught me to sing more efficiently and just flat-out better, and I still hold those lessons close to me. What’s your favourite role you’ve ever played or production you’ve ever been in? Sweeney Todd. Hands down. It was the first real musical I performed in at Theatre Aquarius, when I was sixteen and knew nothing of musical theatre. I had just started voice lessons, and my teacher said, “You should audition for Sweeney Todd. It’s about a barber, and he kills people, and this woman bakes the people into pies and sells them.” I don’t know how that convinced me to audition, but it did. It was the nonchalant paraphrased plot summary that intrigued me, I guess, and that’s really all it takes to sucker me in. So, I auditioned, got the opportunity to play Tobias, and I fell in love. The score is just gorgeous. “Green Finch” still makes me teary if I haven’t heard it in a few months, and the fortissississimo at the end of “Johanna” still has this Pavlovian effect of making my heart pound. I had the opportunity to do the show again last year at Sheridan and play the Beadle. It was a dream come true just to be in it again, and seeing the show from a whole new perspective and character was the best thing that could’ve happened to me and my relationship with that show. Tell me about the process of rehearsing Rent. What were some of the biggest challenges you faced? Mark was a new experience for me. I had always played some kind of supporting role. I’d pop up and be someone eccentric, or funny, or someone funny because he’s eccentric. Then I’d leave and let the leads do their thing. But, with Mark, I finally got the opportunity to exercise my acting stamina. I had to train myself to be always focused and sharp. Also, something I knew I had to deal with was that a lot of Mark’s text is expository and he could easily fall into the rut of glorified narrator. I did a lot of journaling and thinking about how he could still be a hero in his own story with dreams and needs and objectives. And then I crossed my fingers and hoped other people would get what I was doing. Honestly, it was a real privilege and I’m so grateful for the opportunity to play the role. I grew so much from it. Mark’s not usually a real singer’s role. How did you find the balance between the more typical speak-singing parts and moments when you could showcase your own strong vocals? Mark’s problem is this inability to connect, warring with his constant desire to find connection. He wants so badly to belong, but he can’t seem to drop his guard and let people in. So, I saw it as this: when he’s guarded and pensive, he sings like typical Mark. When he loses himself, he just sings. A lot of Marks do a sort of play on Anthony Rapp’s original performance but you really made it your own. How do you approach making those original choices? This will probably sound sacrilegious, but let’s get it out of the way. Going into auditions, I didn’t like RENT, or know it all too well. I saw the movie and knew some of the songs from the soundtrack, but beyond that, the musical was not a favourite of mine, nor this whiny lead role called Mark. When I set out in the early rehearsals, I said to myself; Mark may be speculative, he may be skeptical, he may sing about frustrating situations, but he will NOT whine about them. This Mark has hope. There’s nothing less attractive than a protagonist without a mission, without some semblance of hope. I really wasn’t setting out to be different or the same as Anthony Rapp. I just put myself into Mark. I saw a story in him that I felt connected to that I’m sure many people recognize – the solitude, the need for connection, the need to be included and loved, and most importantly, the need to love someone fully in return. Too many to mention them all. I always dreaded and loved the confrontation with Roger after Angel’s funeral. Such a loaded little battle between the two friends there. “La Vie Boheme” was always a blast, too. Mark gets to slip just for a fleeting moment on Christmas Eve. Perhaps there is one stand-out moment that the audience actually never saw. There was a little backstage ritual we deemed the Cohen Dance. Pre-show, in the wings, stage left, I’d rock out with Karina Bershsteyn, the lovely actress who played Mrs. Cohen, and any of the other cast members who felt like joining in. The only goal was to dance like a Cohen. And, trust me, it was not attractive. Furiously writing music. It’s my passion and my goal to make this my career. I’m working out of a small home studio, and planning to expand and grow in the coming years. I’ve got a demo of some more Top 40 material on soundcloud, and I’m continuing to work on more and more – some music in the same vein, a lot in a completely different realm. I’ve been doing some work for other artists and companies, and the plan is to just make music for the rest of my life, no matter what. Thanks for interviewing me! It’s been a pleasure!